Everyone knows that the risk profile of systematic strategies can change considerably when equity markets turn down and volatilities spike. For an example, a smooth profile of a short volatility delta-hedged strategy in normal regimes becomes highly volatile and correlated to equity markets in stressed regimes. Is there a way to systematically measure the tail risk of investment products including hedge funds and alternative risk premia strategies? Further, how do we measure the risk-premia compensation after attribution for tail risks? Finally, would we discover patterns in cross-sectional analysis of different hedge fund strategies? The regime-conditional regression model is introduced in The Hedge Fund Journal (online paper or PDF on SSRN). I would like to highlight the key results of the methodology so that interested readers can further follow-up with the original sources. 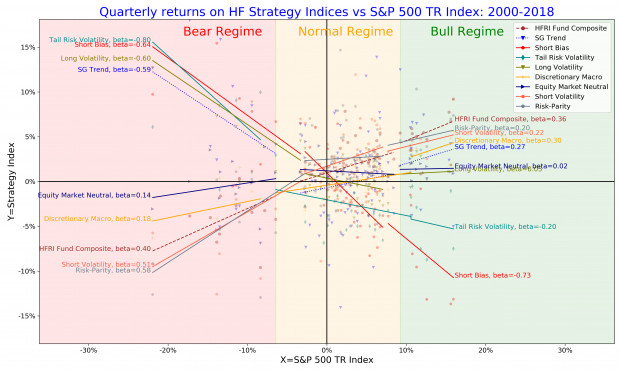 In the top Figure, I show the regime conditional betas for a selection of hedge fund style from HFR indices data using the S&P 500 index as the equity benchmark. Defensive strategies (long volatility, short bias, trend-following CTAs) have negative equity betas in bear regime so that these strategies serve as diversifiers of the equity downside risk. Risk-seeking strategies (short volatility, risk-parity) have positive and significant equity betas in bear regime. Equity betas of most of risk-seeking strategies are relatively small in normal and bull periods but equity betas increase significantly in bear regimes. I term these strategies as Risk-seeking risk-premia strategies. I term strategies with insignificant betas in normal bear regimes as Diversifying strategies. Examples include equity market neutral and discretionary macro strategies because, even though these strategies have positive betas to the downside, the beta profile does not change significantly between normal and bear regimes. As a result, the marginal increase in beta exposure between normal and bear periods is insignificant. ARP: ARP indices using HFR Bank Systematic Risk-premia Indices with a total of 38 indices. In figure below, I plot risk-premia alphas against marginal bear betas grouped by strategy styles. For defensive strategies, their marginal bear betas are negative; for risk-seeking strategies, the marginal bear betas are positive and statistically significant. We see the following interesting conclusions. For volatility strategies, the cross-sectional regression has the strongest explanatory power of 90%. Because a rational investor should require a higher compensation to take the equity tail risk, we observe such a clear linear relationship between the marginal tail risk and the risk-premia alpha. Defensive volatility strategies that buy downside protection have negative marginal betas at the expense of negative risk-premia alpha. For alternative risk premia products, the dispersion is higher (most of these indices originate from 2007), yet we still observe the pattern between the defensive short and risk-seeking risk-premia strategies with negative and positive risk-premia alpha, respectively. For hedge fund indices, the dispersion of their marginal bear beta is smaller. As a result, most hedge funds serve as diversifiers of the equity risk in normal and bear periods; typical hedge fund strategies are not designed to diversify the equity tail risk. All CTA funds and indices have negative bear betas with insignificant risk-premia alpha. Even though their risk-premia alpha is negative and somewhat proportional to marginal bear beta is proportional, the risk-premia alpha is not statistically significant. In this sense, CTAs represent defensive active strategies. The contributors to slightly negative risk-premia alpha may include transaction costs and management fees. All figures are produced using seaborn data visualization package in Python.